While we’re trying to shovel out from under all the ice and snow that hit North Carolina this week, we’re slowing getting Alter Ego #131 in the mail. 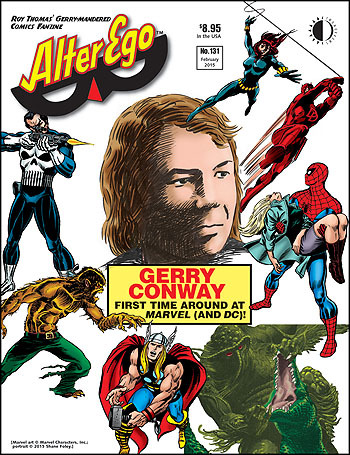 It’s got a feature-length interview with Silver and Bronze Age writing legend Gerry Conway, where he spills secrets about his work from House of Mystery and The Phantom Stranger to Daredevil, Black Widow, Thor, Fantastic Four, Werewolf by Night, The Inhumans, Kull the Conqueror, Sub-Mariner, Amazing Spider-Man—to the creation of The Punisher and the death of Gwen Stacy. It’ll be in stores next week, and is in-stock at TwoMorrows today! See our free preview HERE. This entry was posted in TNT on 18 February 2015 by Mr. Morrow. You likey LEGO. You likey robots. 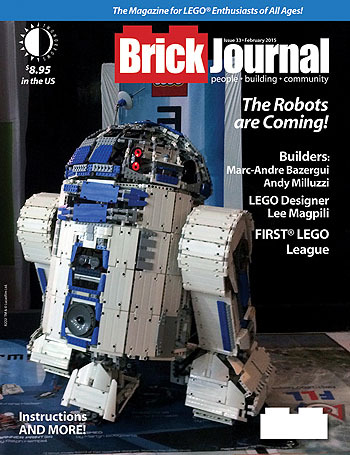 So what could be better than a whole issue of our magazine BrickJournal, devoted to the most amazing LEGO robotics ever built? The new issue (#33) is shipping today, and you can check it out HERE. This entry was posted in TNT on 10 February 2015 by Mr. Morrow.